Nov 07, 2013 in "Epcot International Flower and Garden Festival"
The International Food and Wine Festival is nearing a close for 2013 and Disney is now looking ahead to the 2014 Flower and Garden Festival. 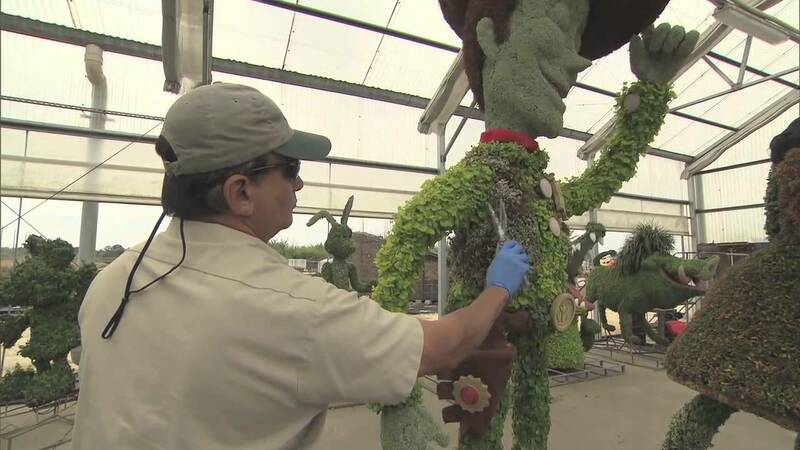 The 2014 Flower and Garden festival will be the 21st year and will run from March 5 to May 18 2014, and for the first time will feature Muppet topiary. Miss Piggy will join Kermit at the World Showcase Plaza area display. The World Showcase marketplace kiosks will return, offering a second chance at some food and wine. New menu items include Piggylicious Bacon Cupcakes and a Barbecued Chicken Leg at the Smokehouse Barbecue marketplace. Read on for more details in the full press release from Disney. Nearly 100 topiaries will animate the landscape during the 75 days when Epcot transforms to a rainbow-hued wonderland of sweeping gardens and exhibits. Back for a second year: outdoor food-and-beverage marketplaces exclusive to this festival that feature sweet and savory bites worthy of indulgence. After debuting at the 2013 festival, the marketplaces will return with new menu items like Piggylicious Bacon Cupcakes and a Barbecued Chicken Leg at the Smokehouse Barbecue marketplace. Floral-flavored lemonades will feature rose and violet notes, and specialty cocktails, wines and beers will offer menu-pairing possibilities. Last year’s top menu picks like the Watermelon Salad with local baby arugula, feta cheese, pickled red onions and balsamic reduction will be back for an encore at the Florida Fresh marketplace. The Flower Power Concert Series welcomes two new acts this year: Gary Lewis and the Playboys (“This Diamond Ring”) March 14-16, and The Alan Parsons Live Project (“Eye in the Sky”) May 16-18. During opening weekend, the series kicks off at America Gardens Theatre with fan-favorite band The Guess Who (“American Woman”) March 7-9. Other pop acts set to perform include Chubby Checker & the Wildcats, The Village People and Paul Revere & The Raiders. (Entertainment is subject to change). Back by demand, the Disney-Pixar “Cars” garden and playground will bring favorite movie characters to life. Tinker Bell’s Butterfly House will be aflutter with hundreds of the winged beauties and fairy topiaries of Tinker Bell and Periwinkle.